The RIT campus is filled with an assortment of artistic and natural beauties. But out of all the spots on campus the Tojo Garden has long been a favorite among students as a place for quiet and respite. The garden is a verdant preserve adjacent to the Eastman Kodak Quad near George Eastman Hall and Frank E. Gannett Hall. 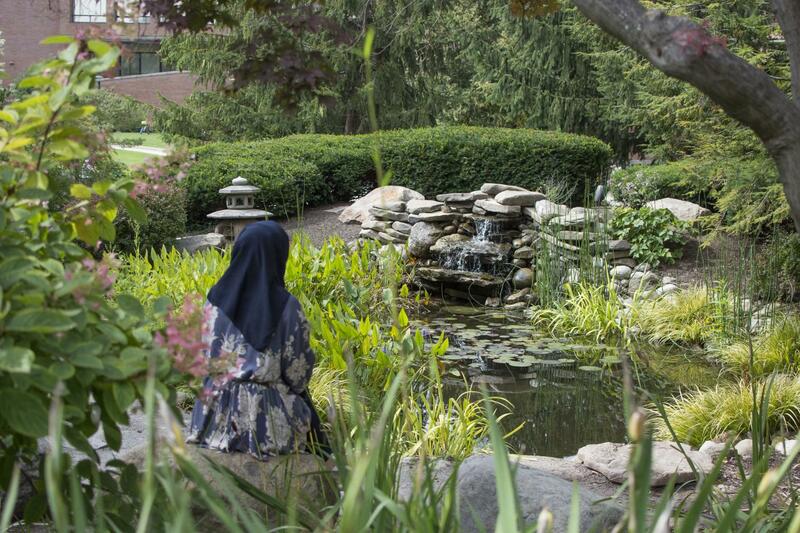 The serene beauty of the garden and its proximity to the CIAS buildings has made it an amazing birthing ground for creative and illustration majors. Its relaxing atmosphere is a haven for students and faculty seeking comfort in the arms of nature. "There is so much beauty here." May’s classmate, second year Illustration major Susan Suyavong, was in agreement. “I think this pond is very peaceful. It is very calming to just sit here and draw,” she said. What many students may not know, however, is that the Tojo Memorial Garden dates back to before the campus was built and was constructed as a memorial. Reporter had the opportunity to dive deeper into this story with Becky Simmons, an RIT archivist who manages historical documents and collections related to the university. “Yasuji Tojo was a popular student back in the day and was a sportsperson for several teams, few faculty members were especially fond of him,” explained Simmons. Tojo's life was tragically cut short after he was fatally injured in a car accident while driving from Washington, D.C. to Rochester in early June of 1964. "Japanese Cherry Trees were planted by the RIT Lettermen’s Club in tribute to his memory. This created the vision of constructing an International Garden that would enhance the new RIT campus. Faculty members Hans and Marga Barschel initiated this project to celebrate diversity which leads to the foundation of the image RIT advertises itself as today." Faculty member Hans Barshel and his wife Marga were Americans of German origin and were very fond of Yasuji. They were sympathetic of the hardships of being an international student — adjusting to the culture and language. They had him over for dinner often, attempting to understand Japanese culture and celebrating special occasions together. In that way, his story isn't different from many others at RIT — although he was thousands of miles away from his family, he found another. "The garden symbolizes the idea of moving forward, how barren land blooms with nature given time. It preserves the identity of students who did not have the opportunity to experience the fulfillment of their lives due to war or other tragedies." Vernon Titus (director of Management in the Evening College) and Bill Toporcer (student personnel and tennis coach) supported Barshel's idea to introduce this garden as a living memorial. They believed that a well-planned and nicely kept garden would not only have educational value, but would also stress a technological institution’s closeness to nature and sincere interest in preserving its beauty for future generations. In 1975, their joint efforts were successful and the university completed the new garden. The garden has evolved since then and has constantly been renovated since its introduction. What remains unchanged is the heart of the garden — a six-foot tall hand-sculpted stone lantern, donated by Tojo's parents to preserve his memory and as a tribute to eternal youth. The lantern represents the five elements of Buddhist cosmology. The supporting base segments represent the idea that our bodies exist on the earth and that death is when our earthly bodies return back to our original, elemental form. The top of the lantern represents spirit while the bottom represents the earth. "Every element in the garden depicts something,” explained Simmons. The lantern isn't the only element of the garden with a hidden backstory. "Every element in the garden depicts something,” explained Simmons. The koi fish depicts good fortune for the ever-growing nature of the garden. In order to create a calm and meditative environment, the garden also boasts an array of trees, flowers and grass combined with a gentle waterfall created to form a calm and thought-nurturing spot where students could meditate and organize themselves. The garden recently received a redesign where benches were added in for students, along with night lighting for a night-time garden view. Whether they know the story or not, the Tojo Garden offers a place of peace and quiet to all looking to escape the hustle and bustle of RIT. While Tojo's life ended much too soon, the garden will continue to serve as a reminder to pause and reflect.